GDC-0575, also known as ARRY-575 and RG7741, is a potent and selective CHK1 inhibitor. 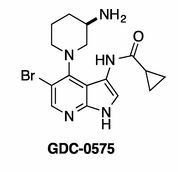 GDC-0575 is a highly selective small-molecule Chk-1 inhibitor invented by Array and licensed to Genentech. Genentech is responsible for all clinical development and commercialization activities. Array received an upfront payment of $28 million and is eligible to receive clinical and commercial milestone payments up to $380 million and up to double-digit royalties on sales. Chk-1 is a protein kinase that regulates the tumor cell’s response to DNA damage often caused by treatment with chemotherapy. In response to DNA damage, Chk-1 blocks cell cycle progression in order to allow for repair of damaged DNA, thereby limiting the efficacy of chemotherapeutic agents. Inhibiting Chk-1 in combination with chemotherapy can enhance tumor cell death by preventing these cells from recovering from DNA damage. GDC‑0575 is designed to enhance the efficacy of some chemotherapeutic agents. GDC-0575 is currently advancing in a Phase 1 trial in patients with lymphoma or solid tumors. We report an efficient and highly regiocontrolled route to prepare a functionalized 7-azaindole derivative—5-bromo-4-chloro-3-nitro-7-azaindole—from readily available parent 7-azaindole featuring a highly regioselective bromination of the 4-chloro-3-nitro-7-azaindole intermediate. In addition to the high efficiency and excellent control of regioisomeric impurities, the process is operationally simple by isolating each product via direct crystallization from the reaction mixture with no liquid–liquid extractions or distillation steps needed. 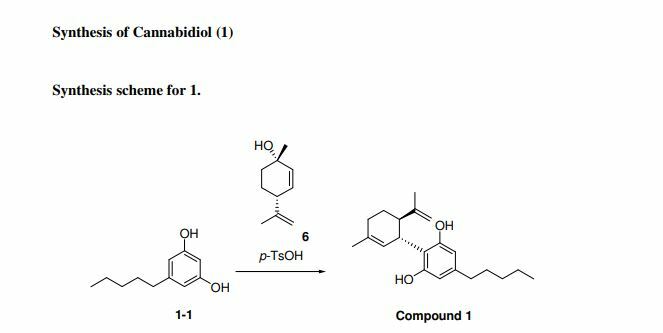 We demonstrated the route on >50 kg scale and 46% overall yield to provide the target product in 97% purity by HPLC, which can serve as a useful building block for the preparation of a series of 3,4,5-substituted-7-azaindole derivatives. To an inerted 10 L jacket reactor, equipped with a mechanic stirrer, a nitrogen/vacuum manifold, a thermocouple, and a condenser, were charged 2-methyl-2-butanol (3.30 L), 5-bromo-4-chloro-3-nitro-lH-pyrrolo[2,3-6]pyridine (330 g, 1.00 equiv), (R)-tert-butyl piperidin-3-ylcarbamate (456 g, 2.00 equiv), and N-methylmorpholine (115 g, 1.00 equiv). The reaction mixture was stirred at 85 °C for 48 h and cooled to 20 °C. The mixture was then washed with 15 wt % citric acid aqueous solution (3.30 kg) and water (3.30 kg). The majority of 2-methyl-2-butanol was distilled off under vacuum at 50 °C. Acetonitrile was added to bring the mixture back to its original volume. Continuous distillation was conducted until a total of 10.3 kg of acetonitrile was added. Water (3.20 kg) was slowly charged to the suspension over approximately 1 h at 55 °C. The slurry was slowly cooled to 20 °C over 4 h. The resulting solid was collected by filtration and washed with a 1 : 1 (v/v) mixture of acetonitrile and water (1.60 L). The product was dried in a vacuum oven under nitrogen at 70 °C to provide 358 g (69% yield) of (i? )-5-bromo-4-(3-(ter/-butoxycarbonylamino)piperidin-l-yl)-3-nitro-lH-pyrrolo[2,3-6]pyridine as a yellow solid. !H NMR (600 MHz, DMSO-i/6): δ 13.12 (s, 1H), 8.60 (s, 1H), 8.39 (s, 1H), 6.80 (d, J= 6.8 Hz, 1H), 3.49 (m, 1H), 3.34 (m, 2H), 3.22 (t, J = 11.2 Hz, 1H), 3.00 (t, J = 10.2 Hz, 1H), 1.88 (dd, J = 12.3, 2.8 Hz, 1H), 1.74 (m, 2H), 1.38 (m, 1H), 1.34 (s, 9H). 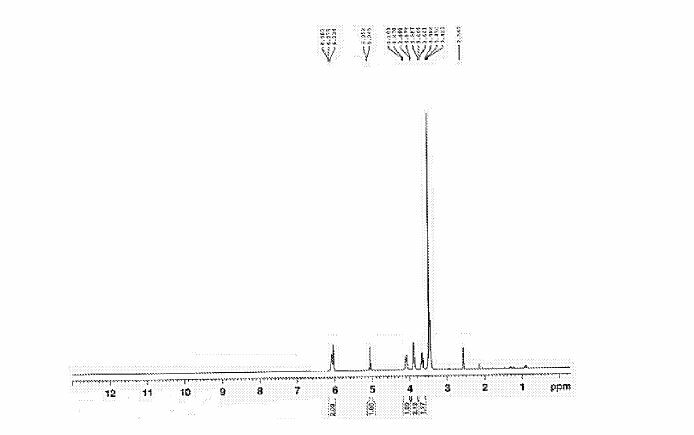 13C NMR (150 MHz, DMSO-<¾): δ 154.8, 148.9, 148.2, 147.9, 130.6, 128.5, 113.8, 109.6, 77.6, 54.7, 48.9, 47.3, 30.0, 28.1 (3C), 24.2. 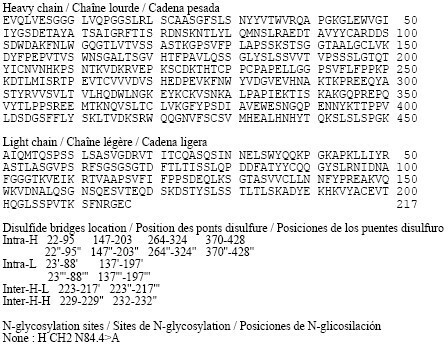 HRMS-ESI (m/z): [M + H]+ calcd for C17H23BrN504, 440.0928; found, 440.0912.
butoxycarbonylamino)piperidin-l-yl)-3-nitro-lH-pyrrolo[2,3-6]pyridine (75.0 g, 1.00 equiv), 1% Pt + 2% V/C (11.3 g, 15 wt %), N-methylmorpholine (29.3 g, 1.70 equiv), and 2-MeTHF (750 mL). The reaction mixture was stirred at 50 °C at 5 bar of hydrogen for a minimum of 2 h. Cyclopropanecarbonyl chloride (26.7 g, 1.50 equiv) was charged into the reactor over 10 min at 15 °C. The reaction mixture was stirred at 25 °C for 1 h and filtered through Celite. The cake was washed with 2-MeTHF (150 mL). The filtrate was washed with 15 wt % aqueous ammonium chloride solution (450 mL) and water (450 mL) and then distilled in vacuo to 1/3 of it’s original volume. Toluene was added to bring the solution back to its original volume. Continuous vacuum distillation was conducted at 55 °C while adding toluene until the 2-MeTHF was below 2 wt %. The resulting solid was isolated by filtration, washed with toluene and dried in a vacuum oven at 40 °C overnight to give 69.8 g (69% corrected yield) of (i? )-5-bromo-4-(3-(tert-butoxycarbonylamino)piperidin-l-yl)-3-(cyclopropanecarboxamido)-lH-pyrrolo[2,3-6]pyridine (1 :1 toluene solvate) as an off-white solid. 1H NMR (600 MHz, THF-i 8, 4 °C): δ 10.76 (s, 1H), 9.72 (s, 1H), 8.15 (s, 1H), 7.90 (d, J = 2.4 Hz, 1H), 7.18-7.08 (m, 5H), 6.41 (d, J = 7.8 Hz, 1H), 3.82 (m, 1H), 3.60 (m, 1H), 3.44 (t, J = 10.6 Hz, 1H), 3.30 (dd, J= 10.6, 3.9 Hz, 1H), 3.03 (d, J = 10.9 Hz, 1H), 2.29 (s, 3H), 2.08 (m, 1H), 1.89 (m, 2H), 1.66 (m, 1H), 1.37 (s, 9H), 1.36 (m, 1H), 0.95-0.80 (m, 4H). 13C NMR (150 MHz, THF-ci8, 4 °C): δ 170.0, 155.8, 149.0, 147.8, 147.6, 138.4, 129.6 (2C), 128.9 (2C), 126.0, 116.6, 115.6, 111.9, 108.8, 78.5, 55.8, 50.2, 49.1, 31.8, 28.6 (3C), 26.3, 21.5, 15.8, 7.70, 7.56. HRMS-ESI (m/z): [M + H]+ calcd for C21H29BrN503, 478.1448; found, 478.1431. To an inerted 1 L jacket reactor, equipped with a mechanic stirrer, a nitrogen/vacuum manifold, a thermocouple, and a condenser, were charged (i? 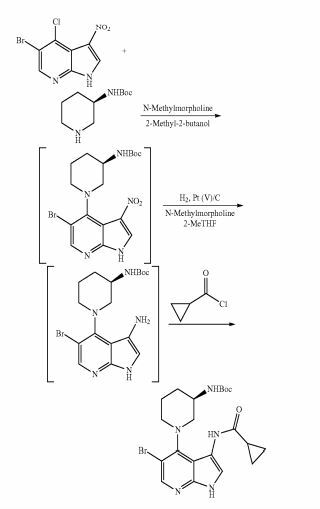 )-5-bromo-4-(3-(tert-butoxycarbonylamino)piperidin-l-yl)-3-nitro-lH-pyrrolo[2,3-0]pyridine (1 : 1 toluene solvate) (30.0 g, 1.00 equiv), tetrahydrofuran (180 mL, 6.00 mL/g), followed by 4.5 M sulfuric acid (36.1 mL, 3.00 equiv). The reaction mixture was stirred at 50 ± 5 °C for 2 h and then cooled to 20 °C. An aqueous piperazine solution (42.4 g dissolved in 190 mL of water) was added slowly at 25 °C followed by addition of 15.0 mL of sat’d brine. The aqueous bottom layer was removed. The resulting solution was stirred at 20 °C for 5 min. Water (22.0 mL) was added. Continuous distillation was conducted at 50 °C by adjusting the feed rate of ethanol to match the distillation rate until a total of 260 mL of ethanol was added. Water (340 mL) was added at 50 °C over 1 h. The resulting solid was isolated by filtration, washed with 20% ethanol in water (2 x 60 mL) and dried in a vacuum oven at 50 °C overnight to give 16.4 g (78% corrected yield) of (i? )-5-bromo-4-(3-amino)piperidin-l-yl)-3-(cyclopropanecarboxamido)-l H-pyrrolo [2,3 -b]pyridine as a light yellow solid. (Note: The proton ( H) and carbon- 13 ( C) spectra of freebase product are very broad. Therefore, the spectra shown below are of freebase converted to a bis-HCl salt.) 1H NMR (300 MHz, DMSC ): δ 11.98 (br, 1H), 9.78 (s, 1H), 8.44 (br, 3H), 8.25 (s, 1H), 7.45 (d, J = 2.4 Hz, 1H), 3.57 (m, 1H), 3.43 (m, 1H), 3.41 (m, 1H), 3.28 (m, 1H), 3.14 (m, 1H), 2.15 (m, 1H), 1.90 (penta, J = 6.5 Hz, 1H), 1.81 (m, 1H), 1.72 (m, 1H), 1.52 (m, 1H), 0.83 (m, 4H). 13C NMR (75 MHz, DMSO- 6): 5 172.9, 149.5, 145.9, 145.1, 121.9, 114.2, 113.1, 107.8, 53.8, 51.1, 47.5, 28.6, 24.37, 14.7, 7.55, 7.45. HRMS-ESI (m/z): [M + H]+ calcd for C16H21BrN50, 378.0924; found, 378.0912. Alternatively, the compound (i? 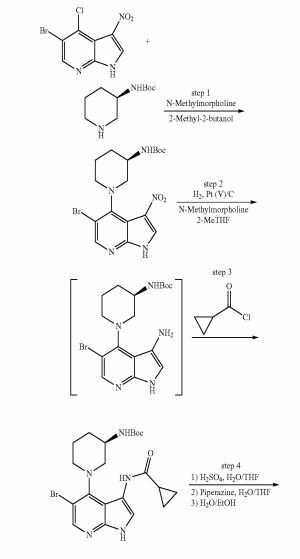 )-5-bromo-4-(3-(fer/-butoxycarbonylamino)piperidin- 1 -yl)-3 -(cyclopropanecarboxamido)- 1 H-pyrrolo [2,3 -£]pyridine can be prepared from 5-bromo-4-chloro-3-nitro-lH-pyrrolo[2,3-b]pyridine and (^)-tert-butyl piperidin-3-ylcarbamate via a through process without isolating (i?)-5-bromo-4-(3-(tert-butoxycarbonylamino)piperidin-l-yl)-3-nitro-lH-pyrrolo[2,3-6]pyridine. The changes to existing procedure are shown as below: The solution of (i? 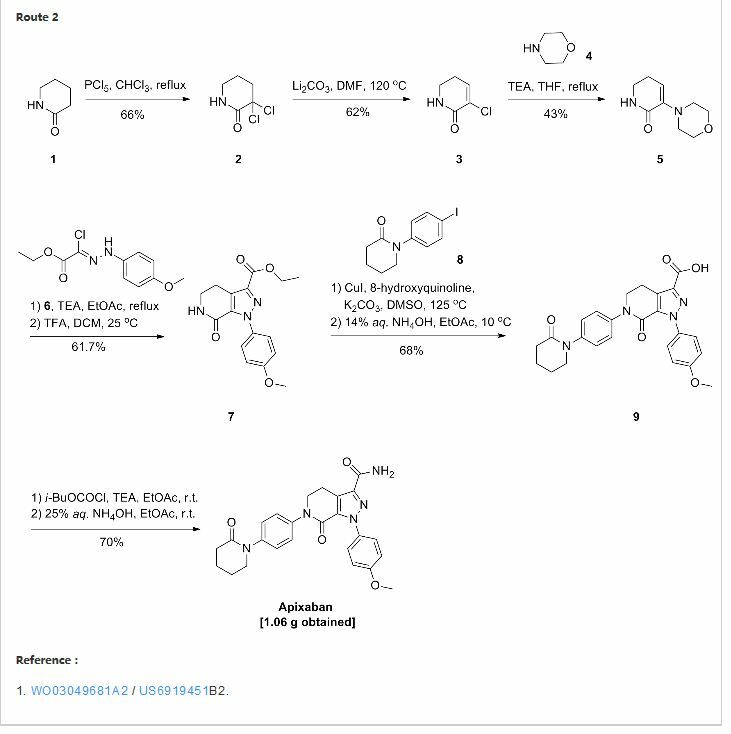 )-5-bromo-4-(3-(tert-butoxycarbonylamino)piperidin- 1 -yl)-3 -nitro- 1 H-pyrrolo [2,3 -6]pyridine was hydrogenated directly in 2-methyl-2-butanol after aqueous washes with 15 wt % citric acid aqueous solution (10.0 g/g) and water (10.0 g/g). The solution concentration in 2-methyl-2-butanol was determined by HPLC weight assay. CHK1 is a serine/threonine kinase that regulates cell-cycle progression and is a main factor in DNA-damage response within a cell. CHK1 inhibitors have been shown to sensitize tumor cells to a variety of genotoxic agents, such as chemotherapy and radiation. U.S. Pat. No. 8,178,131 discusses a number of inhibitors of CHK1, including the compound (i? 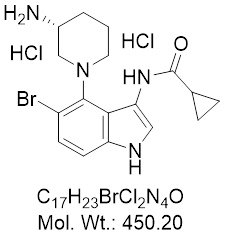 )-N-(4-(3-aminopiperidin-l-yl)-5-bromo-lH-pyrrolo[2,3-b]pyridin-3-yl)cyclopropanecarboxamide (Compound 1), which is being investigated in clinical trials for the treatment of various cancers. To an inserted 1 L pressure reactor were charged (R)-5-bromo-4-(3-(tert-butoxycarbonylamino)piperidin-1-yl)-3-nitro-1H-pyrrolo[2,3-b]pyridine (75.0 g, 1.00 equiv), 1% Pt+2% V/C (11.3 g, 15 wt %), N-methylmorpholine (29.3 g, 1.70 equiv), and 2-MeTHF (750 mL). The reaction mixture was stirred at 50° C. at 5 bar of hydrogen for a minimum of 2 h. Cyclopropanecarbonyl chloride (26.7 g, 1.50 equiv) was charged into the reactor over 10 min at 15° C. The reaction mixture was stirred at 25° C. for 1 h and filtered through Celite. The cake was washed with 2-MeTHF (150 mL). The filtrate was washed with 15 wt % aqueous ammonium chloride solution (450 mL) and water (450 mL) and then distilled in vacuo to ⅓ of it’s original volume. Toluene was added to bring the solution back to its original volume. Continuous vacuum distillation was conducted at 55° C. while adding toluene until the 2-MeTHF was below 2 wt %. The resulting solid was isolated by filtration, washed with toluene and dried in a vacuum oven at 40° C. overnight to give 69.8 g (69% corrected yield) of (R)-5-bromo-4-(3-(tert-butoxycarbonylamino)piperidin-1-yl)-3-(cyclopropanecarboxamido)-1H-pyrrolo[2,3-b]pyridine (1:1 toluene solvate) as an off-white solid. 1H NMR (600 MHz, THF-d8, 4° C.): δ 10.76 (s, 1H), 9.72 (s, 1H), 8.15 (s, 1H), 7.90 (d, J=2.4 Hz, 1H), 7.18-7.08 (m, 5H), 6.41 (d, J=7.8 Hz, 1H), 3.82 (m, 1H), 3.60 (m, 1H), 3.44 (t, J=10.6 Hz, 1H), 3.30 (dd, J=10.6, 3.9 Hz, 1H), 3.03 (d, J=10.9 Hz, 1H), 2.29 (s, 3H), 2.08 (m, 1H), 1.89 (m, 2H), 1.66 (m, 1H), 1.37 (s, 9H), 1.36 (m, 1H), 0.95-0.80 (m, 4H). 13C NMR (150 MHz, THF-d8, 4° C.): δ 170.0, 155.8, 149.0, 147.8, 147.6, 138.4, 129.6 (2C), 128.9 (2C), 126.0, 116.6, 115.6, 111.9, 108.8, 78.5, 55.8, 50.2, 49.1, 31.8, 28.6 (3C), 26.3, 21.5, 15.8, 7.70, 7.56. HRMS-ESI (m/z): [M+H]+ calcd for C21H29BrN5O3, 478.1448. found, 478.1431. To an inserted 1 L jacket reactor, equipped with a mechanic stirrer, a nitrogen/vacuum manifold, a thermocouple, and a condenser, were charged (R)-5-bromo-4-(3-(tert-butoxycarbonylamino)piperidin-1-yl)-3-nitro-1H-pyrrolo[2,3-b]pyridine (1:1 toluene solvate) (30.0 g, 1.00 equiv), tetrahydrofuran (180 mL, 6.00 mL/g), followed by 4.5 M sulfuric acid (36.1 mL, 3.00 equiv). The reaction mixture was stirred at 50±5° C. for 2 h and then cooled to 20° C. An aqueous piperazine solution (42.4 g dissolved in 190 mL of water) was added slowly at 25° C. followed by addition of 15.0 mL of sat′d brine. The aqueous bottom layer was removed. The resulting solution was stirred at 20° C. for 5 min. Water (22.0 mL) was added. Continuous distillation was conducted at 50° C. by adjusting the feed rate of ethanol to match the distillation rate until a total of 260 mL of ethanol was added. Water (340 mL) was added at 50° C. over 1 h. The resulting solid was isolated by filtration, washed with 20% ethanol in water (2×60 mL) and dried in a vacuum oven at 50° C. overnight to give 16.4 g (78% corrected yield) of (R)-5-bromo-4-(3-amino)piperidin-1-yl)-3-(cyclopropanecarboxamido)-1H-pyrrolo[2,3-b]pyridine as a light yellow solid. (Note: The proton (1H) and carbon-13 (13C) spectra of freebase product are very broad. Therefore, the spectra shown below are of freebase converted to a bis-HCl salt. 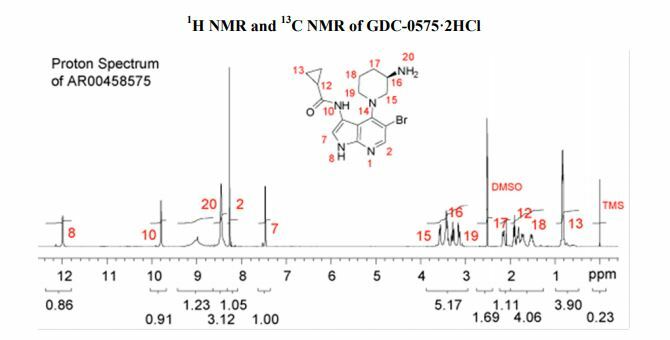 )1H NMR (300 MHz, DMSO-d6): δ 11.98 (br, 1H), 9.78 (s, 1H), 8.44 (br, 3H), 8.25 (s, 1H), 7.45 (d, J=2.4 Hz, 1H), 3.57 (m, 1H), 3.43 (m, 1H), 3.41 (m, 1H), 3.28 (m, 1H), 3.14 (m, 1H), 2.15 (m, 1H), 1.90 (penta, J=6.5 Hz, 1H), 1.81 (m, 1H), 1.72 (m, 1H), 1.52 (m, 1H), 0.83 (m, 4H). 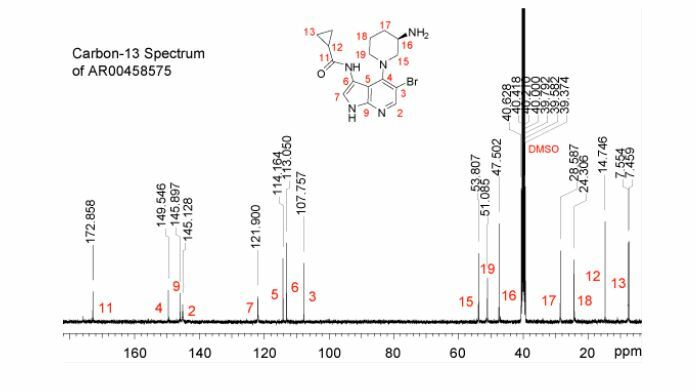 13C NMR (75 MHz, DMSO-d6): δ 172.9, 149.5, 145.9, 145.1, 121.9, 114.2, 113.1, 107.8, 53.8, 51.1, 47.5, 28.6, 24.37, 14.7, 7.55, 7.45. HRMS-ESI (m/z): [M+H]+ calcd for C16H21BrN5O, 378.0924. found, 378.0912. Alternatively, the compound (R)-5-bromo-4-(3-(tert-butoxycarbonylamino)piperidin-1-yl)-3-(cyclopropanecarboxamido)-1H-pyrrolo[2,3-b]pyridine can be prepared from 5-bromo-4-chloro-3-nitro-1H-pyrrolo[2,3-b]pyridine and (R)-tert-butyl piperidin-3-ylcarbamate via a through process without isolating (R)-5-bromo-4-(3-(tert-butoxycarbonylamino)piperidin-1-yl)-3-nitro-1H-pyrrolo[2,3-b]pyridine. 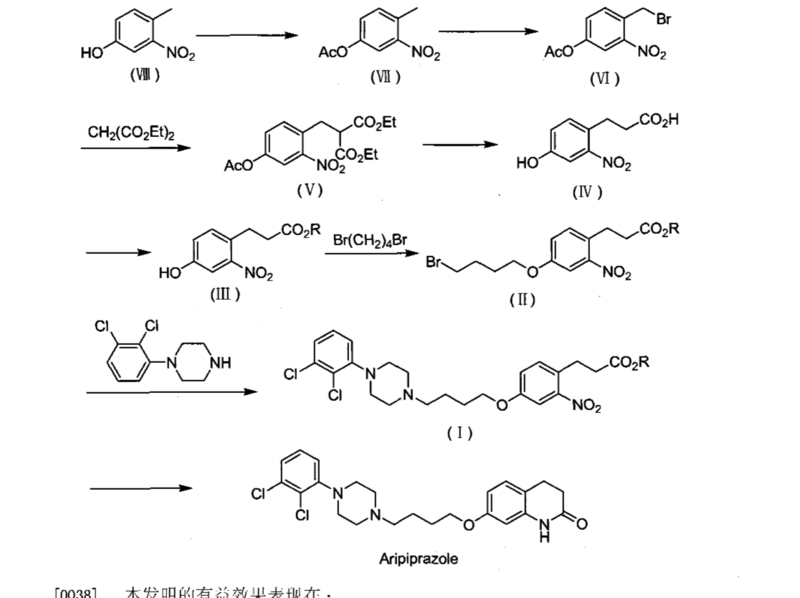 The changes to existing procedure are shown as below: The solution of (R)-5-bromo-4-(3-(tert-butoxycarbonylamino)piperidin-1-yl)-3-nitro-1H-pyrrolo[2,3-b]pyridine was hydrogenated directly in 2-methyl-2-butanol after aqueous washes with 15 wt % citric acid aqueous solution (10.0 g/g) and water (10.0 g/g). The solution concentration in 2-methyl-2-butanol was determined by HPLC weight assay. 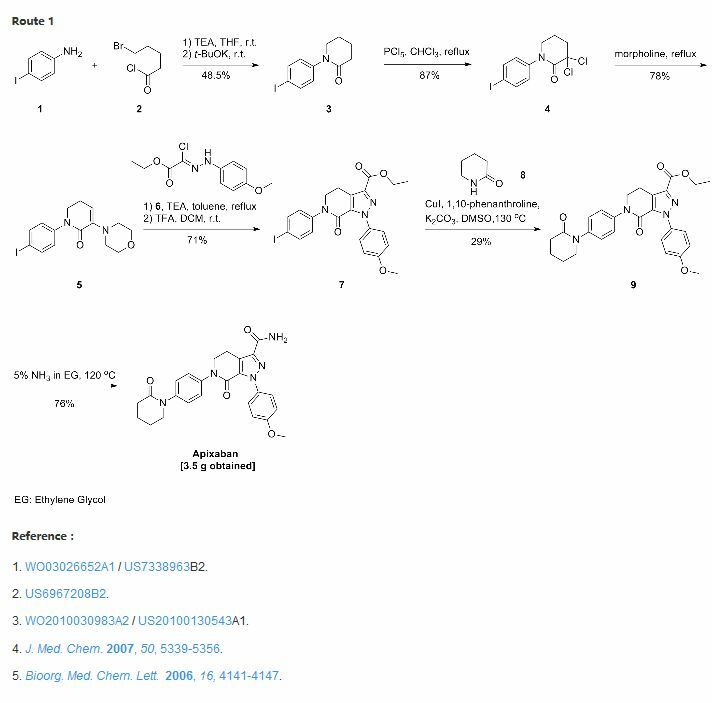 We report an efficient route to prepare Chk1 kinase inhibitor GDC-0575 from 5-bromo-4-chloro-3-nitro-7-azaindole featuring a sequence of nucleophilic aromatic substitution, hydrogenative nitro-reduction, and a robust, high-yielding end-game involving deprotection–crystallization steps. 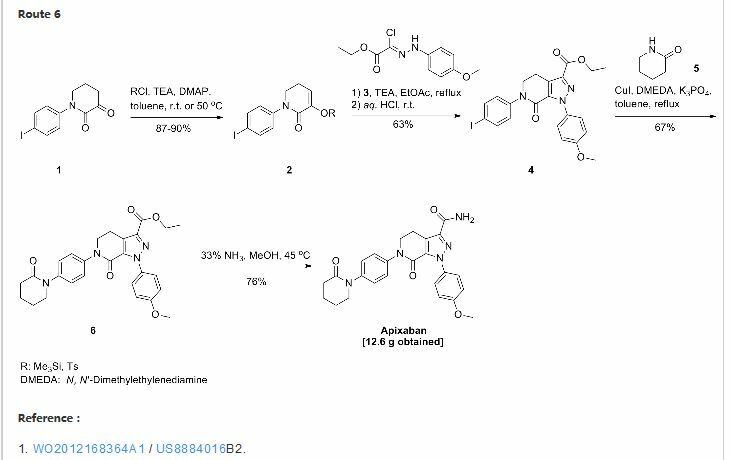 The developed route was demonstrated on 10 kg scale in 30% overall yield to provide the target API in >99.8 A % HPLC purity. 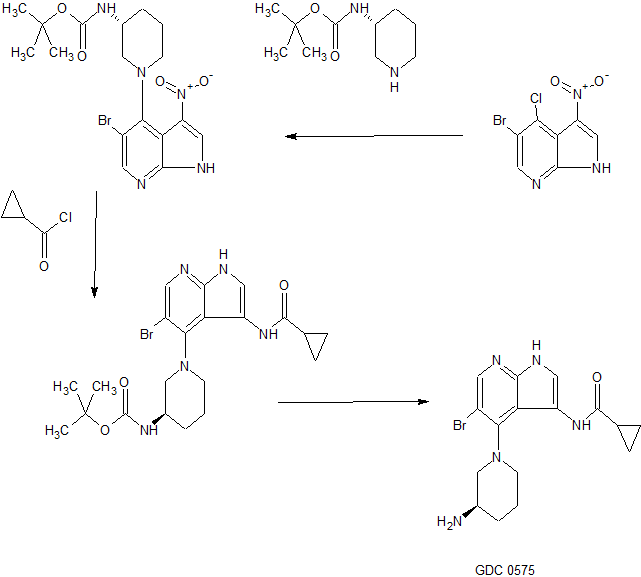 To ………….. to give (R)-5-bromo-4-(3-amino)piperidin-1-yl)-3-(cyclopropanecarboxamido)-1H-pyrrolo[2,3-b]pyridine as a light yellow solid (5.1 kg, 76% yield, 99.9 A % by HPLC analysis). Both 1H and 13C spectra of GDC-0575 freebase are very broad. HRMS–ESI (m/z): [M + H]+ calcd for C16H21BrN5O, 378.0924; found, 378.0912.
anemia repair pathway dysfunction, a potential therapeutic target in lung cancer. Front Oncol. 2014 Dec 19;4:368. doi: 10.3389/fonc.2014.00368. eCollection 2014. PubMed PMID: 25566506; PubMed Central PMCID: PMC4271581. K. D. Davies, et al. M. J. Humphries, et al. By DR ANTHONY MELVIN CRASTO Ph.D in PHASE 1, PHASE1 on March 14, 2018 .